In times of war or complicated emergencies, affected populations run to hide in deeply remote parts that in most cases are hard to reach by ground transport. Only air transport has been used. 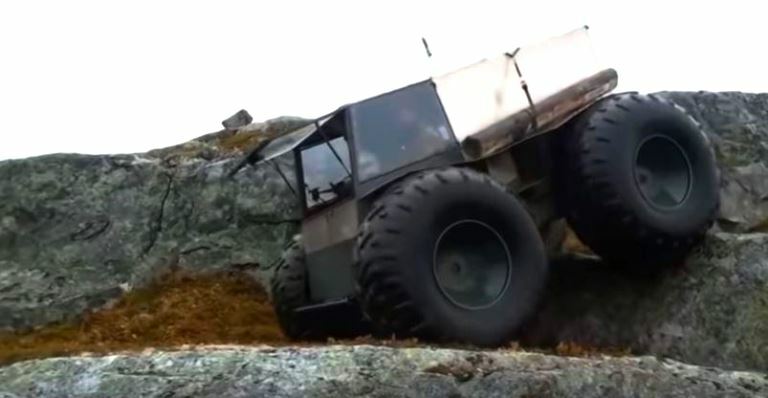 However, a Russian brilliant Alex Garagashyan has designed a super all terrain monster vehicle which can navigate through ice, massive rocks and deep rivers. It would be the best choice for most African military operations that require navigating through thick bushes, crossing wide fast flowing deep rivers, rocky mountains and muddy swamps. The United Nations world food program has already begun using the Sherp vehicle in remote parts of DRC to deliver foods to refugee communities. “Access is a major challenge when it comes to reaching those who are hungry in remote areas. Watch how WFP is getting life-saving food to some of the world’s hardest to reach place,” UN said on Monday. While developing at testing this monster vehicle, Garagashyan said, “ I have had to face many different surfaces including; snow, forests, ice, swamp and rocky mountains. But everywhere my vehicle dealt with it well,” he said. According to a mechanical engineer Amy Elliot, “the Sherp is all terrain because of its massive wheels which are light weight for their size and keeps the Sherp from sinking into minor snow”. She adds that the tyres are made of just two layers of rubber and are strengthened by cords of polyimide. This is compared to normal tyres that have 10-12 layers of rubber and have metal bands in them. Electrical Engineer Tom Wrigglesworth says the Sherp designer created a unique tyre inflation system which responds to the surface the vehicle is being driven on. “If the vehicle is driving on soft snow surface, the tyres will deflate and once the vehicle on firm land then the driver turns a lever and diverts some of the exhaust fumes and fills up the tyres so hard in just 25 seconds,” Wrigglesworth observes. Garagashyan says an ATV has to be balanced the size to power of engine, size of the wheels, transmission ratio… this all together makes an ATV. All these parameters must be in the right proportion. Wrigglesworth says the sherp can drive on water due to its huge tyres weighing about 90kgs that give it enough buoyancy to float.